Del Toro’s brilliance is unquestionable but his talent doesn’t always come through with a completely credible experience. This one is somewhere close to brilliant but in experience falls well short. Sharpe’s sister Lucille also takes an instant dislike for Edith; she thinks the latter is ‘just a child’. There’s plenty of doom and Gothic gloom in here but at its heart, this is a beautiful story (albeit a rather unusual one) of courage, and love. “It is not a ghost story. 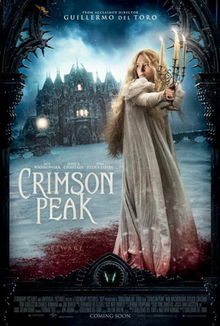 It is a story with a ghost in it,” this oft-repeated line in the film is a reminder that director Guillermo Del Toro’s “Crimson Peak” is difficult to slot into any defined category or genre. The film is a psychosexually violent romance with ghosts dramatically emerging from the floors, doors and eerie hallways.Never entirely satisfying as a horror drama or a romance spectale, the film is visually dazzling. But overall, the film does not tug at you emotionally.